We are a Department of Insurance and Financial Services approved continuing education provider (Provider ID# 0991). All of our online courses can be completed At Your Pace Online in order to help you renew your insurance license, and never include any hidden fees. Once you complete one of our online courses, we will report your course completion directly to the state for you. 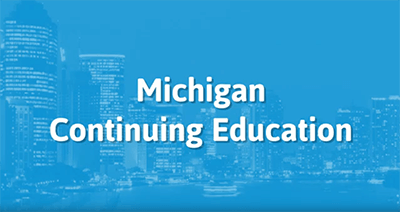 Most Michigan insurance producers must complete 24 hours of continuing education during the two year reporting period to renew their license. Licensees must complete 3 hours in approved ethics courses. All other hours may be completed by taking courses approved in any line of authority. This course provides all 24 hours of Life and Accident & Health CE you need! In addition to 21 hours of life and health topics, you'll also get 3 hours of ethics education. No additional reporting fees. This course provides all 24 hours of CE that you need! This course will review key concepts and principles of Property & Casualty insurance and ncludes 3 hours of ethics and the mandatory exam. No additional reporting fees. This course provides 21 hours of Life and Accident & Health CE! This course will review key concepts and principles of Life & Health insurance. No additional reporting fees. This 4 Hour course will meet your one time Certification Requirements to start selling Life Insurance Annuities in the state of Michigan. No additional reporting fees. This course applies to producers in all lines. This course satisfies 3 hours of Ethics training for any Michigan insurance producer. No additional reporting fees. This 3 Hour course will provide the hours you need to fulfill the one time Certification Requirements to start selling Flood Insurance in the state of Michigan. No additional reporting fees. By the granting of this Certificate of Registration, the Director's representative approves the recommendation. The Director may, after Notice and Opportunity for a Hearing, withdraw the registration of a program of study, which does not maintain standards as determined by the Director for the protection of the public. Sales/Marketing hours = 0. If you disagree with our decision, you may appeal by providing 2 copies of the requested information within 30 days of the date of this letter without any additional fees. However, if you appeal our decision, you must return this document and you may not offer this course until a final disposition is granted. If you need to contact PSI, please email MIINSURANCE@PSIEXAMS.COM.